Following The Equator: Voyages of Equinox: Good Eats!! 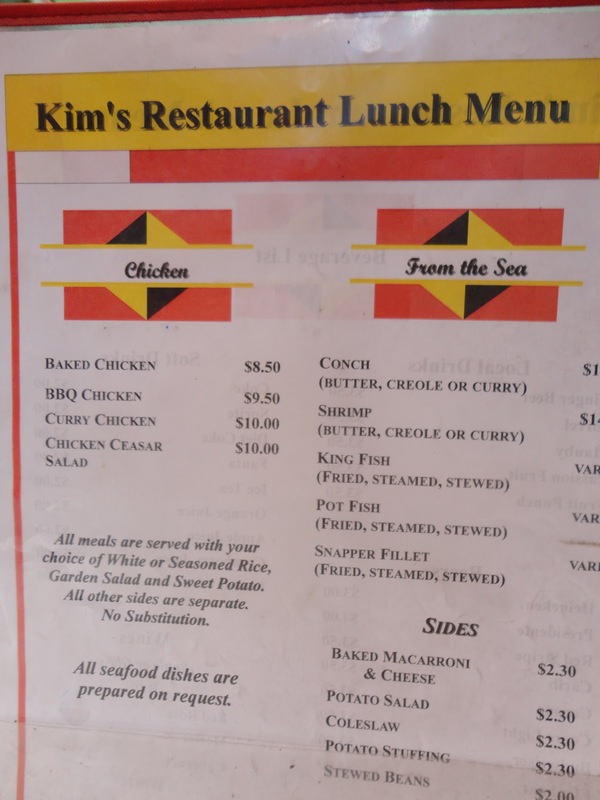 As we've said before, one of our favorite things to do on island is to sample the local fare. We always ask for recommendations before we walk about town, or simply just stop in at places that strike our fancy. You never know exactly what local foods are popular, or in what combinations -- Caribbean cuisine is always a fusion of influences, largely African, Amerindian, Spanish, French, Dutch, Indian and even British (although there are some who would dispute that the Brits have done much to influence cuisine in any way!). We've found that most traditional island fare is spicy and hearty, using fresh seafood and locally-available vegetables. 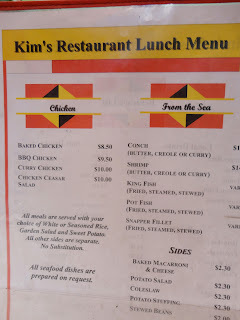 Chicken and goat are main ingredients as is conch, lobster and local fish. Seasonings are important, and there is usually a choice of curry, coconut, spicy jerk, or a tomato-based sofrito. Often ceviche is on the menu as well, making use of local citrus juices, seafood, onions, peppers and tomatoes. There is nothing better than conch prepared this way --- yum!! Pot fish, fried, steamed or stewed - your choice! Ron and I got a couple recommendations for different places, so off we went during our explorations of old-town Chrisitansted. At Kim's modest but charming restaurant, we seated ourselves outside in their garden area, and relaxed with a cold drink. I opted to try the mauby, a favorite Caribbean drink. Mauby drink is made from the bark, and sometimes fruit, of the mauby tree native to the northern Caribbean and south Florida. It's a type of buckthorn tree, and its bark is boiled with spices and brown sugar to sweeten the naturally bittersweet taste. I found it rather tasty, although Ron didn't care for it much! Supposedly, it's a good "cooling" drink, as well as good for calming the nerves and lowering blood pressure. Every island has its own take on Mauby, so I'll be sure to sample it elsewhere, too! Food-wise, we both opted for the conch; Ron got the conch creole, and I sampled the curried conch. Sides included seasoned rice and beans, and a slice of sweet potato. (We did have to ask what it was -- caribbean potatoes, like dasheen or boniato, are not the typical orange yam "sweet potato" found in the States!) Our slices looked rather unappetizing, slabs of white with dark grayish edges...but indeed, tasted exactly like sweet potatoes! Each of our conch dishes were stewed, well-done, soft and delicious, Mine was with onions, peppers and curry, and Ron's in a tomato-based version. Thoroughly enjoyed by us both! where we had our lunch. Definitely local color! Yesterday afternoon, we had lunch at Zeny's, situated on the square near the Post Office in downtown. Zeny's was more Spanish in its choices; Ron had curried chicken and while I wanted the goat stew (a special on Tuesdays), it wasn't available. So, I went with the more generic "Stew Chicken", which was an assortment of bone-in chicken pieces, served in a sofrito-type sauce. A mountain of seasoned rice, along with extra beans, and a salad were the sides to the meal -- substantial and satisfying indeed! Zeny's is the place for good, inexpensive food! We have yet to find a place with conch salad, but we are on the look-out! One thing is certain: no matter what is the menu, there will be something to tempt us! Am I reading the menu right? Does that say the conch can be fixed in "butter" style? What would that be?